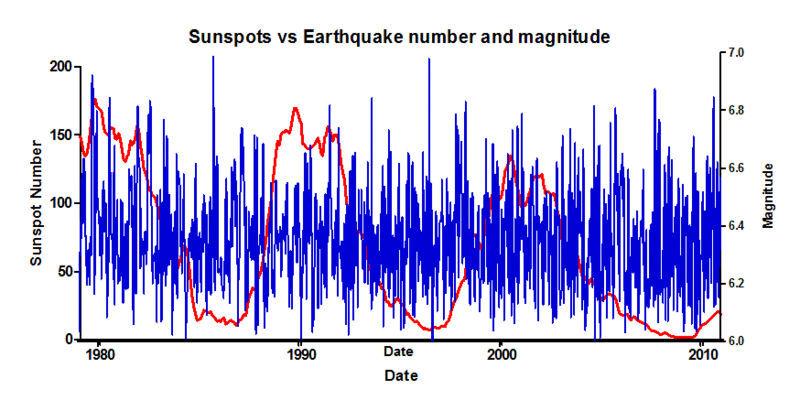 For the benefit of those claiming that solar flares and solar activity affect earthquakes, I have create these two graphs. 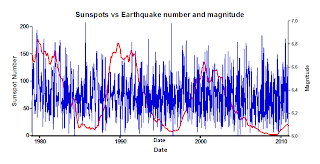 The first is a graph of earthquake frequency and magnitude for all earthquakes of magnitude 6 and above (otherwise we would drowning in noise from magnitude 5 quakes) plotted against sunspot number from 1979 to 2010. Click on the image to embiggen. I’ve use a 4 point smoothing to make the data more legible (which is why some Mag 8 earthquakes don’t appear). Data for earthquakes is from here, and sunspot data is from here. As you can immediately see, earthquake number and intensity is basically random. There is no correlation with sunspot number, which is a proxy for solar activity and flare numbers. You can play around with the raw data and plot it in a variety of ways (binning earthquakes by month etc.) but the answer is the same. No relationship. 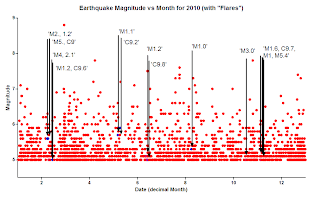 To get a better handle on this, I’ve also plotted all earthquakes for 2010 magnitude 5 and greater against all solar flares magnitude C1 and greater (C is weakest, M more intense and X very intense). Flare data is from the Australian IPS. Coronal mass ejections (when Earth directed) tend to hit 48 hours after the solar flare (click image to embiggen). 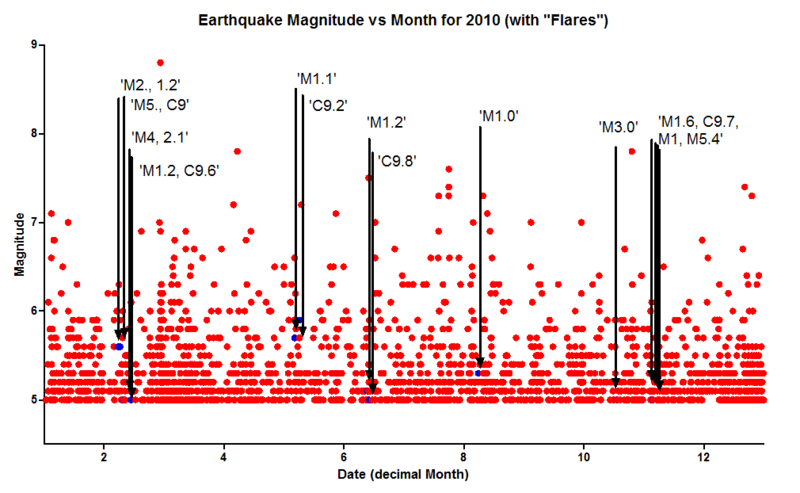 Again, as you can see there is no correlation between solar flares and earthquake number or magnitude. Thanks for this thread, Ian, I think you are onto something here. Accordingly, it will be necessary to correlate CME's which actually strike Earth to earthquakes. It might be good to start with CME's arising from X-class flares and Earthquakes 7.0 and greater. Thanks Ian for the work. I had the same idea. It is of course "apparently no corrollaton" . directly linked but due to our limited perception,rendered invisible. How about time shifting them in relation to one another, earthquakes following, solar. Perhaps eathquakes are the precursors of solar flares. My observation was that the Christchurch and Japanese quakes are very close to the 45th parallels as if the planet were being compressed like a basket ball sat on or a pacific bulge from under the crust. Hey, i have a few days that i cant enter to spaceobs.org; anyone knows what happened?? wondering if you could specify solar flares hitting the earth, not just all solar flares. What would that graph look like? It's the coronal mass ejections which are linked to earthquakes. Besides, your "study" is at best useless, because you cannot link those 2 data sets (one with an average solar activity, and another with factual and precise seismic data). Last and not least, you can STILL notice something on your graph, just look for each time your solar activity is low, you have the highest earthquake. I understand your are sceptical, but this is just not reassuring for anyone. There are fewer of those than actual flares of course, but extracting CME impact data is more difficult. What CME database do you use? But it still dosen't help, the Feb 7-13 Flare complex hurled CME after CME at Earth, with some very nice auroa, but earthquakes, as you can see for yourself, not so much (ie nothing happened). Anyone who thinks that solar cycles, solar flares, sun spots, and CMEs have no correlation to earthquakes clearly understands neither. Anyone can go to USGS, dump the earthquake history database to a csv file, make a graph out of it in Excel, and compare it to solar cycles. The is a very clear and obvious correlation between the two. And if you actually look carefully at the data, earthquakes are no more common in quite times (with very few CME's which is the exact OPPOSITE of the correlation people claim). Look at the first solar minimum for example, or the down and up swings of the solar cycle. You are of course welcome to make and present your own, more detailed graph. I've asked on the comets list, but no-one has replied. umm. Just wanted to point out that during the Feb 7 - 13 period, that Chile was hit with a 6.8 magnitude earthquake on Feb 11. It wasn't over 7 but it did have quite a few nasty aftershocks accompanying it. You need to adjust your time flow data to compensate for delayed reactivity of the Earth from activity of the Sun. Just like the electrical system in the heart; there is a specific amount of depolarization required to trigger a larger complete depolarization, resulting in contraction of the heart muscle, then repolarization to bring the heart muscle cells back to equilibrium. The same analogy can be used for models of the Earth, a specific amount of energy is required before a reaction can take place. In this case, before 'earthquakes' occur resulting from intensified solar activity, or shifts resulting in crust movement, the energy input from the Sun into the Earth must be significant enough to trigger reactions, in way of earthquakes. Isn't there a relationship between lunar/sun positions, both conjoined and opposite, relative to continent/tectonic plate rotational position?